FIANNA FÁIL HAS overtaken Fine Gael as the most popular party in the country, according to the latest opinion poll. The Sunday Business Post/ Red C poll puts Fianna Fáil at 29 points – three ahead of government party Fine Gael, which remains at 26. 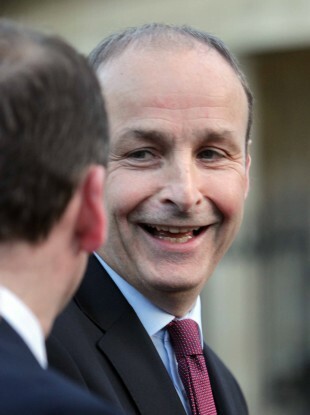 Fianna Fáil jumped three points since the last poll. Sinn Féin is down two points to 13, while support for Independents (excluding the Independent Alliance) has dropped four points to seven. Labour and AAA-PBP remain in the same positions with six and five points respectively. The Green Party has jumped two points to four – bringing them in line with the Social Democrats. Meanwhile, a Sunday Times Behaviour and Attitudes poll also has Fianna Fáil having gained in popularity. According to that poll, the party is at 30, up five since the last poll. Fine Gael is down one to 25, while Sinn Féin is three points to 14. The poll results may pile further pressure on Taoiseach Enda Kenny, who has recently been facing down criticism and calls for him to step down as party leader from disillusioned backbench TDs. While Fine Gael are in government, the party is under constant pressure from Fianna Fáil – who occupy the opposition benches but can still influence policy. The rise in support for Fianna Fáil will add fuel to the fears of Fine Gael TDs that their party is losing out while the opposition grows in popularity. The poll was conducted over telephone and surveyed 1,000 people between Monday and Wednesday last week. Email “Fianna Fáil is now Ireland's most popular party ”. Feedback on “Fianna Fáil is now Ireland's most popular party ”.